This blog is going to be on a bit of a Hiatus for the next few weeks. I'm getting married this weekend and we're spending our honeymoon in Australia. I'll be photographing and writing about the experience, as we'll be getting paid for writing a few articles about our various adventures and scenic trips while going around the country. We'll be spending a few days in Cairns, then heading to the middle of the country to see Ayers Rock (Uluru). 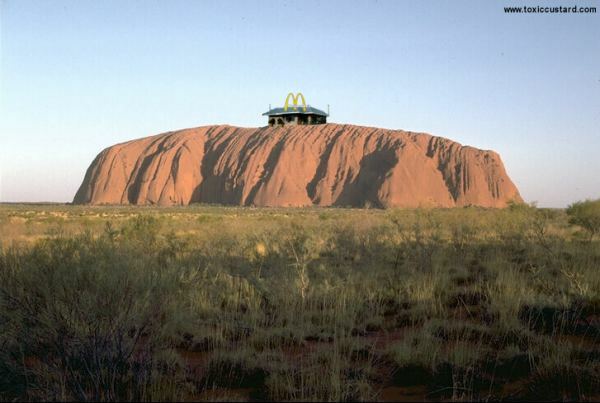 No, there's not a McDonald's on top of the rock, that's a bit of an in-joke, I guess. Near Ayers Rock, we'll having dinner under the stars, which should be a great experience. We'll also be going to Sydney and going out to the Hunter Valley Wine country for a day as well. If I find some internet access, I'll post some photos of the various dining experiences we have.